32’3” x 9'6” X 4', registered as 7.36 tons. SPRAY fished Morecambe Bay until the early 1960s, then she fished the River Dee by the Evans family of Heswall. She returned to Maryport for many years. She was then bought by the present owner Tom Middlebrook in 1987 who had her completely rebuilt over a period of three years. SPRAY is a regular competitor in the Liverpool and Conway Nobby races. LR102 [Lancaster] 30.10.1896 until 31.12.1900 sold to Silloth. CL4 [Carlisle] 07.09.1912 until 18.12.1913 sold to Annan. BA40 [Ballantrae] 26.01.1914 until 30.05.1916 sold to Silloth. CL4 [Carlisle] 22.04.1916 until 17.11.1920 sold to Morecambe. LR20 [Lancaster] 15.12.1925 until 16.09.1937 to Barrow. BW3 [Barrow] 03.10.1938 until ? SPRAY was built for John Gardner of 1 Main Street Morecambe, owned until at least 1898. Insured with Morecambe Fisherman's Mutual insurance 1896 until 1901 to the sum of £40. 1920 until 1925 she was used as a yacht by James Baxter, fish merchant of Morecambe. Raced in the Morecambe Regatta of 23rd September 1921. Sold on 15th December 1925 to Wilfred Woodhouse of 27 Cross Street, Morecambe, who with his son got one hundred and twenty stone of big plaice out of the top end of the bay, a Morecambe record. Insured with Morecambe Fisherman's Mutual insurance 1924 until 1936. Moved to Barrow in 1938 when bought by Hugh Molineaux, he restored her and continued to work her. Bought by Bill Rawlinson (June 1944 photographed with B1718 Alec aboard) who took the Britt engine out and then sold to Tom Hesketh who kept her on Barrow beach. Inherited by Messrs, James Alan Hunter, Archibald Hunter and Roy Hunter of 44 Ferndale Road, Hoylake from their uncle in Barrow, to bring her from Barrow she had to be dug out of the mud. Fitted with a petrol paraffin, pocket valve engine. Sold on 5th August 1966 to Henry Evans of 21 Mostyn Avenue, Heswall for £210. On 23rd November 1966 the sale to John Howard Keegan of 56 Marine Road, Prestatyn was cancelled due to a breach of contract. Bought on 4th March 1968 by Harold Edward Hooper of 59 Ross Avenue, Leasowe, Wirral for £250, fitted a 3 cylinder Lister engine. Sold to John Housley of Hoylake. Advertised in The Fishing News. 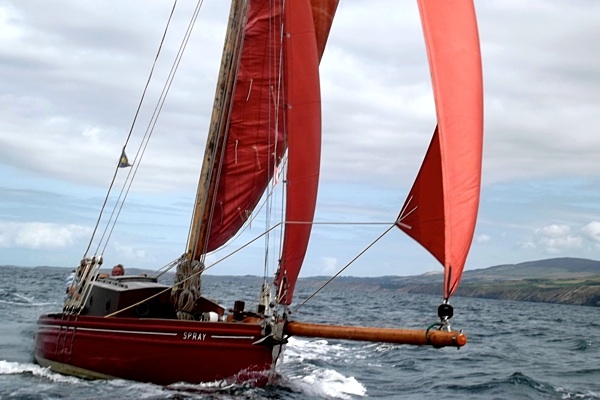 Bought 1978 by Colin Gilmore from the Green, Hoylake where she was ashore without an engine, mast or running rigging. Removed to the Brunswick Dock Liverpool, fitted with the mast from Moonlight. Sold 1984 to Mr Dickson of Maryport for £2,000 and delivered to Barrow, from where he continued to Maryport. Bought in 1987 by Tom Middlebrook and rebuilt.